Rasha has an unlimited pan rotation versatile effect light featuring 3 x 3zone led bars. Each bar with 3 led can be individually controlled, which produce narrow beams for a powerful midair effect, pulsing, strobing and sweeping beam effect. It can project out 9 intense narrow long throw beams, features fast tilt movement and continuous pan rotation, dimming and strobe. 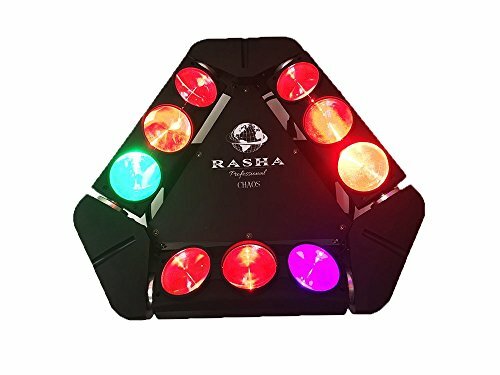 It has three individually controllable led bars with 9x individually controllable 15w rgbw multichip leds in a compact size and lightweight housing with 150 degree motorized tilt and unlimited rotating. Pan can be very precisely positioned, indexed or programmed to produce rapid sweeping movements of a 5°beam that comes with preprogramed macros for convenience, master/salve, sound active, auto as well as dmx function. If you have any questions about this product by Rasha Professional, contact us by completing and submitting the form below. If you are looking for a specif part number, please include it with your message.